Living Space: 2500 sq. ft. Spectacular ocean view home with pool located in the desirable & upscale neighborhood of Lagunas in the mountains above Dominical. The 4.75 acre site sits at an elevation of 1,200 feet with year-round cool mountain breezes and fantastic views of the Pacific Ocean, the Baru River Valley and the Osa Peninsula. The house was custom-built to US standards in ’07 and consists of 3 bedrooms, 3 full bathrooms, 2,500 sq ft, concrete block construction, single-hung windows, vaulted custom wood ceilings, concrete driveway with remote-controlled security gate, swimming pool, huge covered carport & rear patio. Kitchen has granite counter tops with full back splash, custom teak cabinets, detached island bar finished in teak with bar stools & cocktail sink, gas oven/range, full size side-by-side refrigerator, microwave, double stainless sink, fully equipped. The single-story split floor plan is both unique & desirable for Costa Rica, with each bedroom having a full-size bathroom & shower, walk-in closets, ceiling fans & sliding glass doors opening up onto the expansive pool deck. The layout can comfortably accommodate 3 couples/families as a vacation rental with each having their own living space & privacy. The 4.75 acre site is meticulously landscaped with many colorful gardens & mature fruit trees including a covered vivero producing a variety of vegetables, herbs & fruit. Lagunas is an organized community that offers the best roads, treated water system and security in the southern zone. 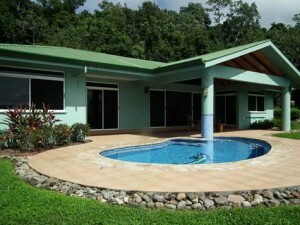 Great central location only 10 minutes to the town & beaches of Dominical, 30 minutes to Quepos/Manual Antonio and 25 minutes to the town/services of San Isidro de el General. Please feel free to contact Dominical Real Estate for any questions you have and to schedule a showing!